I’ve long heard stories about military jets making training runs out in Death Valley. After having a brush with a few of the jets myself while out at the U2 Joshua Tree earlier this year, I had been wanting to go back to Death Valley to try and photograph the flybys. After doing some research online, I found that the prime place to see the jets was a place called Father Crowley Point on the western edge of Death Valley. As it turns out, Father Crowley Point is just up the road a bit from where the U2 Joshua Tree is located. The Point over looks Rainbow Canyon, which has been nicknamed Star Wars canyon by the pilots who fly there. The jets enter into the canyon, flying low through the canyon at elevations of maybe 200 feet. The maneuver is called the Jedi Transition. I totally dig the nick names! If you show up at Father Crowley Point at the right time, you can watch the flybys from a pretty close vantage point. On Independence Day weekend, I made my way to the point in hopes of catching the air show. I arrived at Father Crowley Point around mid morning and set out to find the best spots for viewing and photographing the planes. 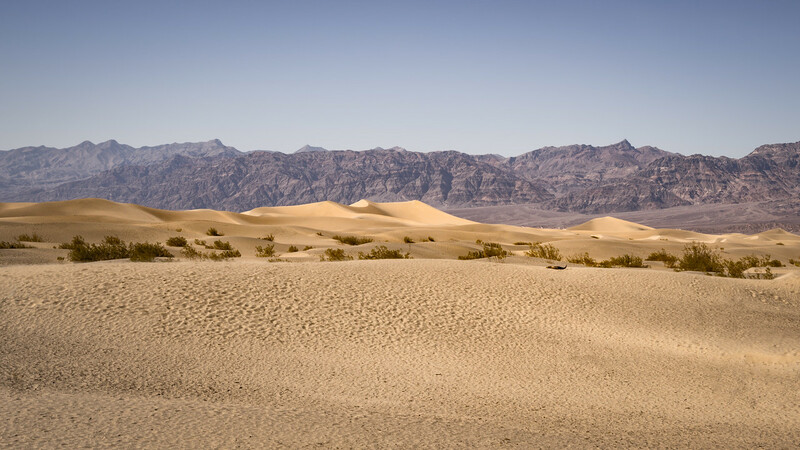 There is a large parking area just off highway 190, which is the main road through Death Valley. You can park right at the canyon edge, there is just a side walk and a railing separating the lot from the ledge. 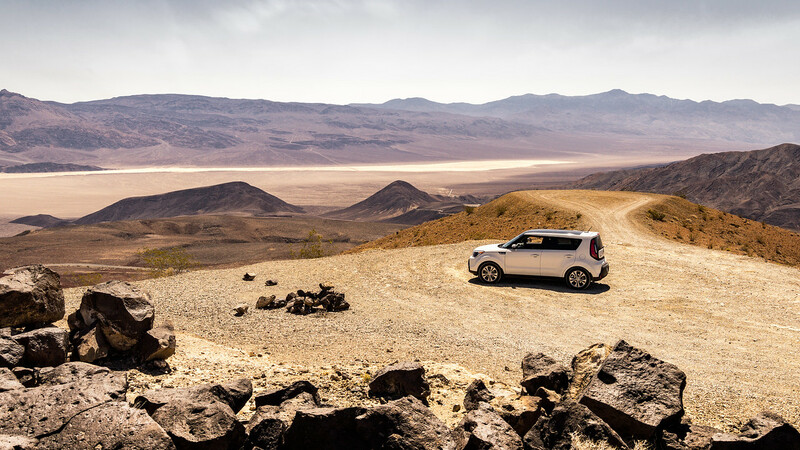 After parking in the lot for a short time, I decided to explore the dirt road up to the point overlooking the Panamint Valley below. The road looks harmless enough, but it’s pretty bad in spots. Had I known how rough that road would be, I probably would have stayed in the parking lot. However, once at the point, I was treated to a pretty spectacular view. 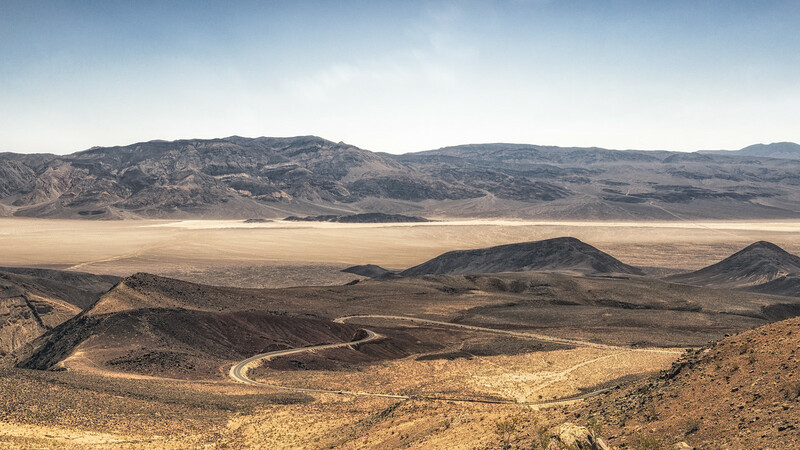 The Panamint Valley and Hwy 190 Snaking Into The Distance Towards Death Valley. From the point, there is a rocky area that you have to climb through to get to the rim of the canyon. I made a trek out to the edge to see what the view would be and it was a pretty good view to be sure. However, I decided that I preferred to be closer to the car and my supplies and not sitting among the rocks on this trip. So, I headed back to the car and headed back towards the main parking lot. Along the way, I stopped to check out one other vantage point. 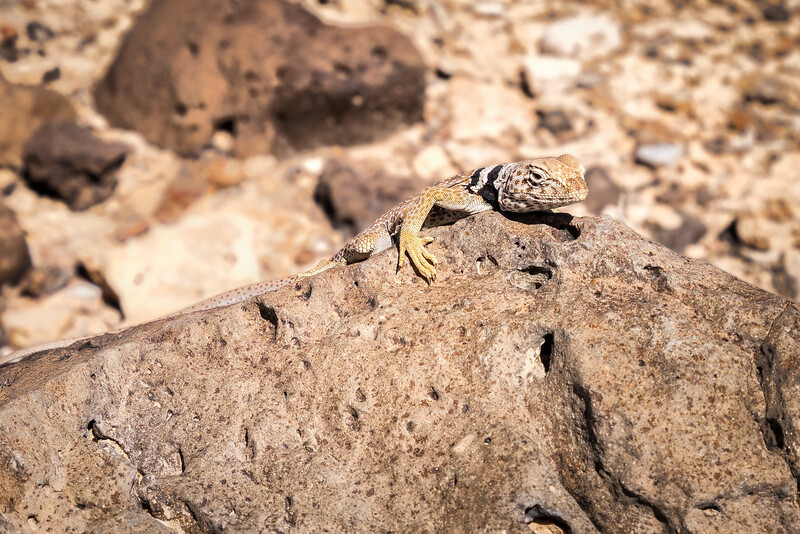 There I found a new little friend, a basin collared lizard. I was surprised that he let me get so close without running off. This must have been his favorite rock! Back at the main lot, I grabbed a spot along the railing and waited… and waited… and waited. Not a single plane had come through. 🙁 Not one to give up easily, I sat there for a good 6 hours. I watched the tourists come and go, taking their walk up to the rim grabbing a few selfies and then head off to the next spot on their trip. As late afternoon rolled around, I finally gave up on the fighter jets. In an effort to come home with some photographs for the day, I decided to head through Death Valley and go home via the eastern route. As I headed down the mountain towards the valley I watched as the temperature on my dash kept rising. When I left Star Wars Canyon, which sits at an elevation of 4000 feet, the temperature was a tolerable 89F. By the time I reached Stove Pipe Wells, which sits at sea level, the temperature was a scorching 118F. 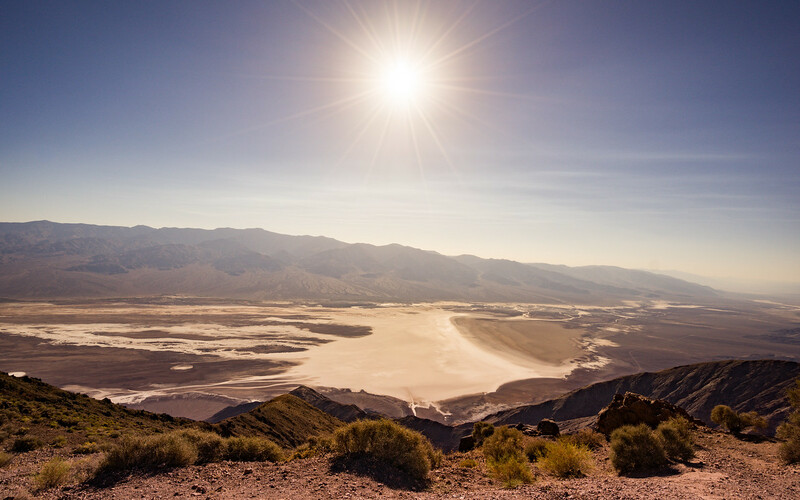 While it’s always cooler at altitude, the special features of Death Valley exaggerates the effect. The Valley’s unique location and the way the air moves here is the reason that it holds the title of Hottest Place on Earth. I stop at the general store at Stove Pipe wells for a cold drink, a snack and to top off my gas tank. The winds had been so fierce, you couldn’t slide your credit card into the slots on the gas pumps…too much sand had gotten in! I run into some cyclists who were crazy enough to be riding through Death Valley in this heat! I retreat to my air conditioned car! When I came upon Mesquite Sand Dunes, I made a quick stop. I hadn’t been to the dunes since my first trip to Death Valley back in early 2015. Usually filled with people climbing the dunes, there are only a few people here today and they don’t stray far from the parking lot. I wished that I could hike to the big dunes, but today is not the day for hiking. I leave the comfort of my car but don’t venture further than about 50 feet into the dunes. It’s just too hot today. I take a couple of quick shots and head back to the car. 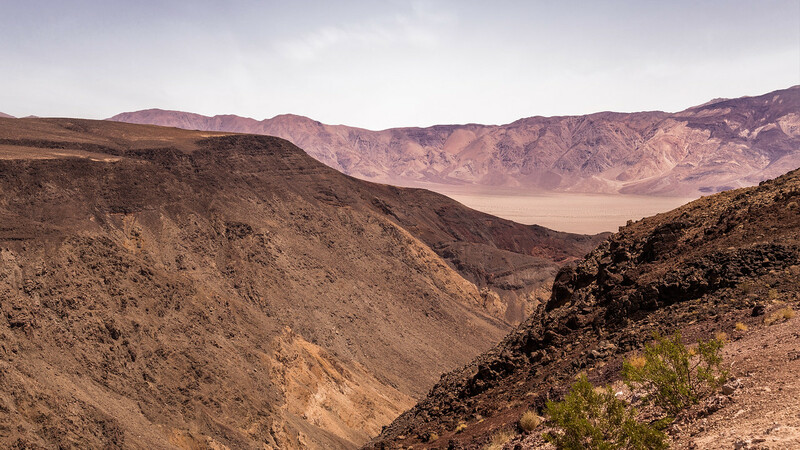 The higher elevations are the place to be in Death Valley today, so I head for Dantes View. The idea was to stay for sunset and then maybe shoot some stars but with a long drive home ahead of me, I grab a quick photo of Bad Water Basin below and head for home. So my fighter jets were a bust and the valley was just too hot to explore, but it was still a fun adventure. If nothing else, I can say that I know what summer is like in Death Valley. I’ll be back again, maybe next time the planes will show up! To see all the full sized photos from this trip, visit my Gallery. If you go: During the summer temperatures can reach 120F or higher. If you must visit during the heat of summer be sure to carry plenty of water with you and never hike after 10am. Be prepared to survive. Be aware of your surroundings and never step or put your hands in places you can’t see. Rattle snakes, scorpions and black widow spiders are active this time of year. Be sure to check the park’s website for any alerts before you plan your trip. Thanks for sharing your images. Next time you head out to Jedi, be sure to go during the middle of the week. Tuesdays thru Thursdays average 10 passes per day, while Mondays and Fridays average 6 passes per day, and you’ll be extremely lucky to get one pass on the weekends. And I find that anytime near the holidays is slower, as airmen tend to take their block leaves during this time. Also, since the jets bank left in the valley when flying west to east, you will end up with mostly belly shots when shooting from Father Crowley. I find that the vantage points below Father Crowley to be much better (trailhead: 36°21’29.3″N 117°32’04.9″W) and will provide you with a much better variety of shots and get you closer to the action. Hope this helps for your next venture out!